RUBICK (AUS) (Bay 2011-Stud 2015). 3 wins-2 at 2-at 1000m, 1100m, A$379,500, MRC Schillaci S., Gr.2, Blue Diamond Prelude (c&g), Gr.3, ATC TAB Iphone App 2YO P., 3d ATC Challenge S., Gr.2, 4th MRC Blue Diamond S., Gr.1. Out of SW Sliding Cube (AJC San Domenico S., Gr.3), a three-quarter sister to SW Redoute’s Choice and SW Platinum Scissors, a half-sister to SW Manhattan Rain and SW Echoes of Heaven. Sire of SP Alburq, Biscara, Krameric and of Rubic Rose, Yes Yes Yes and of the placegetters Chia, Miraculous, etc. His oldest progeny are 2YOs. Provocative Man (g. by Denman). Placed at 3 in 2018-19 in Aust. My Little Friend. Winner at 2, SAJC Resourceco 2YO H., 4th SAJC Dequetteville S., L.
Urban Royal. Winner at 1300m in 2017-18, 3d MRC United Petroleum H.
Chloebell. Winner at 1600m in 2017-18 in Aust. Miss Provocative. Winner. See above. ALIZEE (Sepoy). Equal Leading Older Female on the 2018 WTR (Sprint). 6 wins from 1100m to 1600m, A$1,486,850, to 2018-19, ATC Flight S., Gr.1, Queen of the Turf S., Gr.1, Light Fingers S., Gr.2, Tea Rose S., Gr.2, Christmas Classic H., L, Everest is Coming H., 2d ATC Silver Shadow S., Gr.2, Magic Night S., Gr.3, 3d MRC Thousand Guineas, Gr.1, 4th ATC Vinery Stud S., Gr.1, NSW Tatt's RC Furious S., Gr.2. ASTERN (Medaglia d'Oro). 5 wins-3 at 2-to 1400m, A$1,179,550, ATC Golden Rose S., Gr.1, Silver Slipper S., Gr.2, Run to the Rose H., Gr.2, Kindergarten S., Gr.3, Surf Meets Turf 2YO P., 2d VRC Coolmore Stud S., Gr.1, ATC Roman Consul S., Gr.2. Mogador (Lonhro). 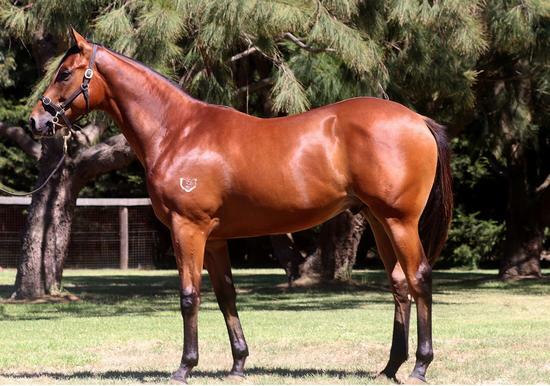 2 wins-1 at 2-at 1000m, 1100m, A$288,600, ATC Pro-Ride H., TAB Place Multi 2YO P., 2d MRC Blue Sapphire S., L, BRC Queensland Day P., L, GCTC Spill the Beans Yearlings H., Qld Tatt's RC Carlton Mid P., BRC Megaport P., 3d Qld Tatt's RC WJ Healy S., Gr.3, ATC Broccolini H., SCTC Paddy Walsh Painting P., 4th ATC Skyline S., Gr.2, Clarence River JC Ramornie H., L-twice. Flouze (Zabeel). Winner. See above. LA BARAKA (Euclase). 6 wins. See above. Robrick (Grand Lodge). 5 wins from 1400m to 3000m, A$149,337, AJC Lost World H., MVRC Members Equity Bank H., 2d VRC Bagot H., L.
READYOR (More Than Ready). 4 wins-2 at 2-at 1000m, 1200m, A$271,975, AJC Keith Mackay H., L, Flying Doe H. Producer.